Dr. Sandaldeep Singh always appreciates feedback from his valued patients. To date, we’re thrilled to have collected 12 reviews with an average rating of 4.92 out of 5 stars. Please read what others are saying about Dr. Sandaldeep Singh below, and as always, we would love to collect your feedback. I always have an enjoyable visit. The staff is pleasant and friendly. I would recommend this Dentistry for any one who hates going to the Dentist. After going to Sunnysmiles you will look forward to your six month check up. 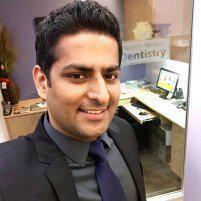 Dr Singh, DDS is great. My mother was the one who told me about this office. Wiyh my work schedule and kiddos the office hours are ideal for us. The staff is friendly and very helpful. The Dr has been great and always making sure we are ok during the appiontment. Love it.. no complaints here. I can’t begin to explain how happy I am to have discovered Sunny Smiles Dentistry! The staff is very friendly and knowledgeable. The office is clean, beautiful, and the equipment is state of the art. I had the most gentle cleaning that I’ve ever had with Ally and Dr. Singh was just amazing! Dr. Singh and his staff are the best. They are caring and do a professional job! They always want to make sure you're not in pain before, during, and after the procedure. Definitely worth checking them out! Always a pleasure to go see Dr Singh and his wonderful staff. He does great work and always explains everything so you know whats going on. I highly recommend him to anyone for all your dental needs. all the staff were very polite and professional ; one week before the appointment day i received reminders on email and text messages and on the day of appointment I again receive text messages from for doctor and from sunny smile that I have an appointment !! Very nice and explained everything thoroughly. Very quick service too. Went in 15 mins early was greeted with a warm friendly smile . Taken back to x-ray immediately Dr and staff very friendly, professional . Very happy with my visit .